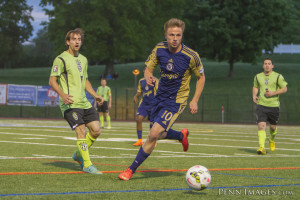 A summer tradition resumes tonight in Reading, Pennsylvania as the Philadelphia Union take the short trip to Berks County to face their Premier Development League affiliates, Reading United A.C.. This will be the sixth meeting between the clubs, and serves as an opportunity to highlight the strong partnership between the Union and Reading. But the game is more than that for the clubs. The annual Union friendly versus Reading United is a night for the fans, a celebration of soccer in a community that has embraced the beautiful game. Fans of both clubs have a chance to see their heroes play up close and interact with the players in an intimate environment that can’t be replicated on the big stage of PPL Park. The close partnership between the clubs will be very apparent for fans attending the match. Since entering MLS in 2010, the Philadelphia Union have signed nine former Reading United players. Ray Gaddis, Andrew Wenger, and C.J. Sapong once dominated the pitch at Exeter High School’s Don Thomas Stadium, leading United to the 2010 Mid-Atlantic Division crown and a place in the PDL National Semifinals. 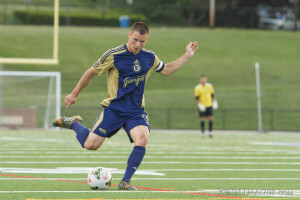 John McCarthy helped lead Reading on a magical run to the third round of the 2013 U.S. Open Cup, where they faced the New York Red Bulls in Harrison, NJ. For Reading, the affiliation with the Union means former academy players like Darius Madison, Keegan Rosenberry, and Shane Campbell stay on a developmental path that may one day lead them to a professional contract with the Philadelphia Union while playing for United. Once a week, the PDL side trains at the Union’s new training fields at PPL Park, with some players invited to train with the first team. Such opportunities have given Reading an edge on other PDL clubs, allowing the United coaching staff to recruit some of the nation’s top college soccer players. Tonight’s match is an important chance for Reading’s college stars to test themselves against their professional counterparts while attempting to catch the eye of the Union technical staff. Who might be this year’s Ray Gaddis, who caught the eye of the Union coaching staff with his fine performance in the inaugural friendly in 2010? The young defender would eventually hear his name called by the Philadelphia Union at the 2012 MLS SuperDraft. What can fans attending the match expect from Reading United? United Head Coach David Castellanos has his young college stars playing an aggressive, attack minded brand of soccer with an emphasis on possession and quick ball movement. It’s a style that has served Reading well through the early days of the 2015 Premier Development League season. United currently sit second in the PDL’s ultra competitive Mid-Atlantic Division with a 3-1-1 record, one point behind the New York Red Bulls U23s but with a game in hand. Defensively, Reading has been difficult for PDL teams to break down. Kyle Morton has led the United backline to a nearly perfect record, beginning the season on a 396 minute shutout streak before finally conceding two goals to the D.C. United U23s. Former Union Academy product Quincy Thomas has transitioned into the holding midfield role for Reading, providing cover for the gifted center back pairing of Martin Nygaard and Andrew Moullin. The wing backs like to press high up the field, joining Reading’s potent attack. Rosenberry has been Reading’s best all-around player through United’s first seven matches of 2015. The rising senior from Georgetown University serves as United’s captain, leading by example with his professionalism and tremendous work rate. Rosenberry has played as both a holding midfielder and at right back for Reading in 2015. The Union Academy product has a great soccer mind, doesn’t mind getting stuck into a tackle and can dictate play when he moves into the midfield. The Lancaster County native is one of the top prospects in college soccer and will likely hear his name called very early in the 2016 MLS SuperDraft. 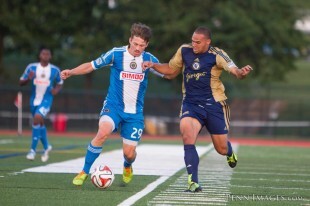 The Delco native has been in fine form for Reading in 2015. Campbell is a constant scoring threat, having scored five goals in five matches for Reading. Campbell, who will be a junior at Georgetown this fall, is still refining his craft but possesses the size and pace to feature in the pro ranks in the future. The Philadelphia native, an outside back for Reading in 2014, has made a seamless transition to the midfield in 2015. Lazorko is a fierce competitor who uses his pace and vision to leave opposing defenders frustrated. The St. Joe’s rising senior’s work rate is unquestionable as he makes lung busting runs up and down the field in support of his teammates. Lazorko has a goal and an assist for Reading in 2015. Morton’s play for Reading in 2015 has been nothing short of exceptional. 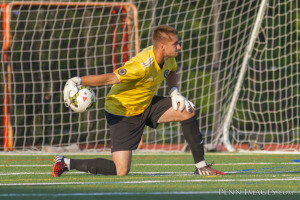 The 6’4″ goalkeeper has made some huge saves for Reading in 2015, most notably a highlight reel stop to deny Lehigh Valley United a game winning goal on a strike that seemed destined for the back of the net. The West Chester, PA native is strong in the air and does well organizing Reading’s back four. Author: Sean Doyle Sean writes about Reading United AC, and he apparently did it well enough that, after joining PSP, Reading asked him to take over as the club’s communications coordinator. He remains a PSP contributor and does his best to maintain objectivity and keep the roles separate. Follow him on Twitter @CoachSeanDoyle. Is Rosenberry eligible to be signed as a Union homegrown player? Since he was an Union Academy player I would think so. Just wondering because if he is truly projected to be selected early in the 2016 MLS Superdraft, isn’t this exactly the type of player the Union should be signing as a homegrown? This continues to be a vexing topic and one I am certain I do not understand. What constitutes a HG player? How can a player training with a professional club academy then be part of a draft. So confusing. Without having reviewed today what I am about to suggest you try to verify its accuracy, I think if you go on the MLS website and then scroll down to the bottom of the page in the fine print links there is something called roster rules. Open that, plough through the bureaucrat-ese, and you’ll find definition of home grown players. I think you can only have three but that is memory, and mine is no longer trustworthy. These details precede the new 2015 CB, so may be obsolete. Again, from memory, pfeffer’s orginal contract maybe up this year, so there may be a new HGP slot opening up, if the limit is three. I believe you can sign 3 per year . .. but even if the max was 3 they only have 2 right now as Hernandez was not resigned this year. Madison has more of plus side for the next level….especially if you want someone who puts the ball the back of the net………goals scorers don’t come around often…..you get them when the opportunity presents itself. Keegan’s a great footballer…….I just think you take the gunslinger first before anything else….again, they win you matches. Naw, the Union will sign some undersized slow “technical” player who will never see the pitch. Think McLaughlin. exactly….that was my whole point…..get the goal scorer! I haven’t noticed Jimmy being slow, neither in preseason nor at Harrisburg. Three seasons ago at Harrisburg I would have said the ability to stand up to physical play was the issue; two, he handled that in USL. This preseason he looked like he belonged, to me. I wish he would get a good chance. Jimmy isn’t slow and is fine footballer……there are 100 ballers exactly like him though. He wouldn’t be where he is at and the position he plays…if he had no pace.But, ballers like Madison score goals……guys like that don’t come around often, they win you matches and hardware……you need to strike while the iron is hot with guys like that…..otherwise someone else is grabbing him. Rosenberry, Campbell, and Madison will all be drafted if they don’t get signed by the Union as HG players. Rosenberry is a stout right back who can also play d-mid. Campbell is hands down one of the best true left backs in the 2016 draft class and MLS teams drool over that. And Madison is a goal scorer, no other way to put it. If the Union were smart they would sign all 3 and develop them into MLS players. For clarification, Darius Madison was not included in my “players to watch” as he’s back at UVA taking courses and won’t play tonight. I wanted to keep fans focused on the standout Reading players that will feature tonight against the Union.